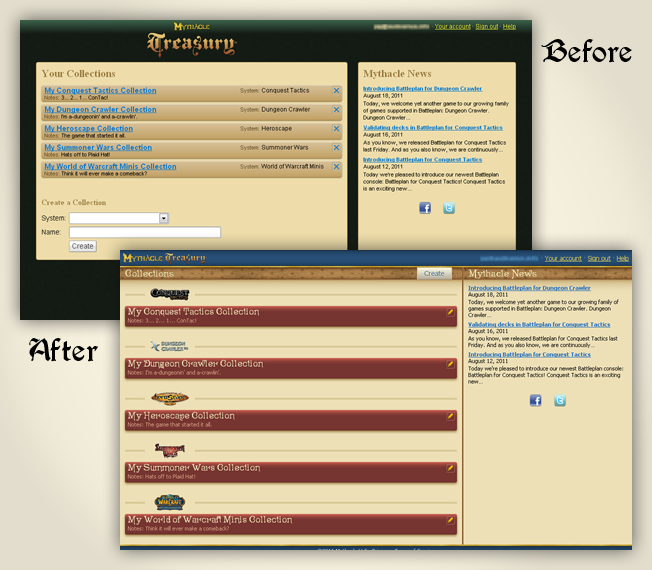 Today we've added an option to show thumbnail images of the game items listed in Mythacle Treasury. This should help you more easily identify the entry you wish to edit while working on your collection. The full-size images for a game item are also available, accessed from the Entry Details form. While we have images for most of the items in Treasury, there are a few that are missing. Specifically, Heroscape collections don't have images for Glyphs or Terrain items, and there aren't any images for World of Warcraft Miniatures items. Rest assured that we are working to add these missing images so we can provide you a complete collection manager for all the games we support. Today's release is an especially exciting one: Mythacle Treasury now works on (modern) mobile touch devices! It has been a good while coming, and we've put in many long hours, but now Treasury is ready for you to use on your touch phone or tablet! It was a surprisingly difficult task to design a single website that works across a wide spectrum of browser implementations, screen resolutions, and input mechanisms while keeping it suitably responsive for listing hundreds (and potentially thousands) of entries in a collection. We're pleased with the result, and we trust you will be, too. We've tested on a number of mobile and tablet devices, and most tend to work well. But, admittedly, there are some quirks on some devices. However, I assure you we'll continue to iron out the wrinkles as best we can while supporting as many devices as possible. In the near future we'll be posting a web page that lists the browsers and devices we test on, so you can easily check if our websites are supposed to work on yours. I know the big question many of you are asking now: when will Battleplan go mobile? Soon. Very soon. Work on it is well underway, and the code libraries developed for mobilizing Treasury will be reused in mobilizing Battleplan. In the mean time, be sure to get your collections entered! There's a lot of fresh, new code in Treasury. If you experience any issues with it, we invite you to tell us in the Treasury Help Group and we'll do what we can to fix it. As before, these outstanding photos are the work of Matt "AliasQTip" Baker. Visit his website and Heroscapers.com thread to see the many ways he contributes to the Heroscape community. Of particularly pertinent interest, check out his 2012 Heroscape Calendar featuring some of the photos he's taken for Battleplan. We wish you the best of fun in 2012. Have a Mythacle New Year! 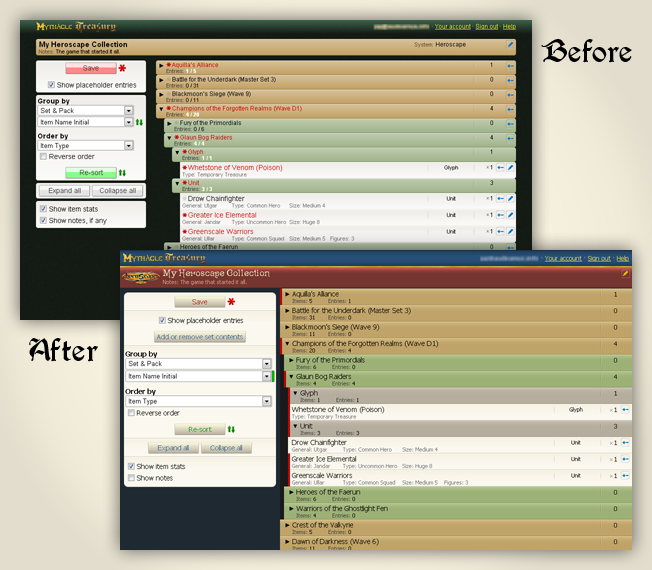 Check out Mythacle Treasury's newly redesigned interface. We've made a number of improvements, both aesthetically and functionally, streamlining many of the interface elements. 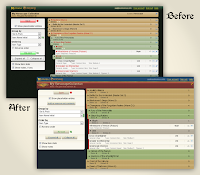 Below are some before-and-after screenshots for visual comparison. Today, we welcome yet another game to our growing family of games supported in Battleplan: Dungeon Crawler. Dungeon Crawler is an expandable adventure card game that has 4 different gameplay formats: solitaire, competitive, cooperative, and multi-player. Battleplan for Dungeon Crawler provides the stats and images of all the available cards and will help speed up your deck creation so you can have more time to play. And, if you have a Mythacle account, you can save your setups to have them ready for later. If you haven't heard of Dungeon Crawler yet, we invite you to browse the cards in Battleplan and then head to the official Dungeon Crawler website where you can learn more about the game, purchase your copy of the game, and see what the dungeon has in store for you.